Democrats Fend Off Legal Reform Amendment, Implore Colleagues to Consider "The Face of Trial Lawyer Victims"
Washington, D.C.--Democrats in the U.S. House of Representatives defeated a tort reform amendment to their health care bill, arguing with special passion that limits on legal fees would victimize trial lawyers. 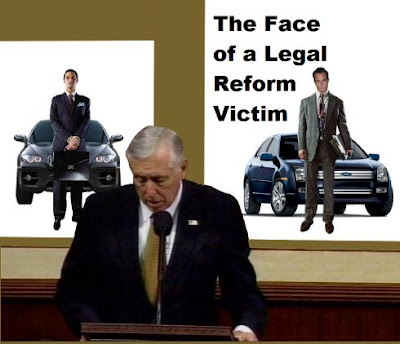 Democratic House Majority Leader Steny Hoyer (D-MD), imploring his colleagues to consider "the face of legal reform victims," held up two photos of personal injury attorneys. One, protected by the current legal regime, stood proudly in a tailored suit in front of his BMW. The other, the purported victim of legal reform whom Hoyer described as "stripped of his dignity at exclusive cocktail parties," stood forelornly in an off-the-rack suit in front of a more modest mid-range Ford model.